National Firearm Act items saw a huge jump — including a 50 percent increase in suppressor registration and 39 percent bump in short-barreled rifles registered — according to new data released by federal regulators. The information comes from the latest Firearms Commerce Report, which also contains information about domestic firearms manufacturing, as well as the importation and exportation of firearms. The report provides an overview of the National Firearms Registration and Transfer Record, which is the federal list of all items, such as suppressors, SBRs, short-barreled shotguns, destructive devices and any other weapons logged under the NFA as of April, and updates figures released in February 2016. In the 14-month period between reports, the total number of NFA items of all kinds has climbed to 5,203,489 — an overall increase of more than 800,000 items. While the numbers of AOW’s, machine guns and SBSs all saw negligible increases, the biggest jumps in the 14-month interlude came in the numbers of registered SBRs and suppressors. “Part of the rise in SBRs can likely be traced to the rise in suppressor ownership, building or buying an SBR is a natural next step for a gun owner because the reduced length of an SBR makes the weapon system lighter and more compact overall,” Todd Rathner, with the NFA Freedom Alliance, told Guns.com. Short Barreled Rifles have been increasingly popular in recent years, with numbers climbing ever since 2011 when the number registered stood at just under 75,000, a figure that has multiplied by a factor of four since then. Helped in part by a rush to purchase suppressors before changes to how the ATF allows trusts to be used for ownership, the numbers of silencers listed in the NFTFR rose from 900,000 to over 1.3 million between reporting periods. 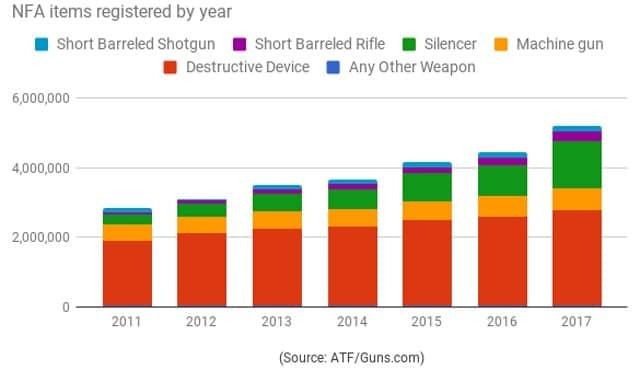 Put into perspective, the increase was almost twice as many new suppressors than were on the books in 2011 — 285,087– and represents the largest single year bump since the ATF began releasing data. Williams said that Smith & Wesson’s acquisition of Gemtech, one of the oldest standalone silencer companies, is a prime example of mainstream gun makers embracing suppressors. In recent years, Sig Sauer and Ruger have embarked on their own in-house lines of suppressors while Remington has moved AAC’s production into its Huntsville factory. “Consumers want these accessories to be able to protect their hearing, and the big-name manufacturers want to be able to deliver,” Williams said, going on to predict 2017’s numbers to settle back down to pre-41F normal, mirroring the 130,000 or so suppressors sold in 2015. One wild card on the horizon is legislation in Congress to partially deregulate suppressors, moving them from NFA regulations and treating them as regular firearms which can be transferred after a simple Brady check. The Hearing Protection Act has 159 sponsors in the House and 18 in the Senate but is still locked in committee.